Wednesday was the first day back at school for my kids and I wanted to have a special after school treat to share with them while talking about all the activities of the day. It just so happened that I had an overgrown zucchini from the garden that would be more suited for baking than for using in an evening meal. Zucchini bread was the obvious choice, but I wanted something different. Trying to get children to eat a veggie like zucchini can sometimes be a challenge, so I took into consideration that Mabelle, my youngest daughter, firmly believes that chocolate is a food group. (That's my girl☺.) With a quick internet search, I landed on a recipe that I knew I could work with. Not only did the end result bake up beautifully with a high dome (don't be afraid to fill your muffin wells to the top), but the taste and texture are outstanding. The bulk of the taste and texture comes from melted dark chocolate and zucchini. Both contain antioxidants and vitamins. Healthy, right?? Well, I even took it a step further and substituted half of the oil called for in the original recipe with 0% fat Greek yogurt. Even healthier! I used just a touch of cinnamon for a subtle spice and added espresso powder for a deeper chocolate flavor. And for the double chocolate... I folded a good cupful of chocolate chips into the batter. Now we're talking. The recipe makes for an odd number of muffins (15 standard) but trust me, you will want those few extra muffins to nibble on. You can even bake the extra batter in small ramekins or a mini loaf pan. 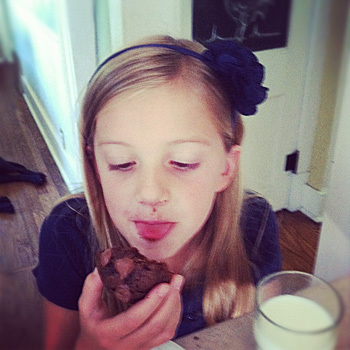 When Mabelle came home from school that day, her eyes widened with excitement when she saw the counter full of chocolate muffins. "Ooh are those chocolate muffins for me?" I sat her at the counter and poured her a glass of milk. First bite-- "Mmm, chocolate." Second bite-- "Oh, yummy." Third bite and right after this picture was taken-- "Um, Mommy? What's this green thing?!" I couldn't lie. I let her in on the secret ingredient. Her response-- "That's o.k. 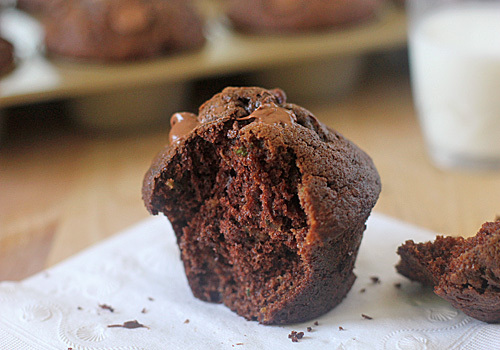 because these are really good chocolate muffins!" Kid tested... mother approved☺. In a medium bowl whisk together the flour, espresso powder, cinnamon, baking soda and salt; set aside. In a separate small bowl melt the chocolate in the microwave or over a pan of simmering water; set aside. In the bowl of a stand mixer fitted with the paddle attachment or using a hand held mixer, beat the eggs and brown sugar on high speed until light and creamy in color, about 1-2 minutes. Reduce the speed to medium and gradually pour in the oil. Using a rubber spatula, scrape down the sides of the bowl; add the yogurt, zucchini, and vanilla and mix on low until combined. With the mixer running, add the dry ingredients and mix until incorporated. Add the melted chocolate and mix until combined. Using a rubber spatula, fold in the chocolate chips. Fill the muffin cups almost to the top. Reduce the oven temperature to 350° F and bake the muffins for 20-22 minutes. Allow the muffins to cool in the pan for 10 minutes. Remove the muffins to a rack and cool. Serve barely warm or at room temperature. Enjoy! I recently found your blog and I can't wait to dig into some of your recipes. My family and I live in Wisconsin and have a large backyard organic garden! It's such a treat to be able to cook with fresh veggies from the garden! We have tons of zucchini and I can't wait to make these muffins. We love chocolate & muffins—perfect combo! They look so delicious. I just started a new blog that I wanted to share with you. Here's a Chocolate Zucchini cake recipe you & your kids might like! I'd love for you to check out some of my recipes and let me know what you think. Thanks & have a sweet day! Nicole these look great! I love the pic of your daughter enjoying one! 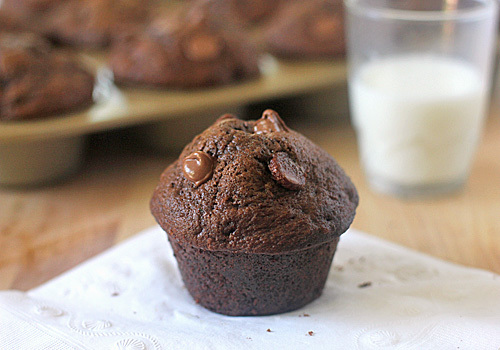 Been looking for a good choc chip muffin recipe...these look divine! Can't wait to try them! These were DELICIOUS! They are so moist and chocolate-y. Thanks for sharing! Delicious! I made these yesterday and so far everyone LOVES them! I didn't have XL eggs and just used Large eggs and they came out fine. Will be making these all summer with the zucchini that grow prolifically in the garden. I just made these tonight with my gluten free flour (maninis gluten free flour). They look and smell amazing. Pretty sure these won't last too long in my house. I made them in 3 mini loaf pans. It took an additional 20 minutes. Soooo moist! I have been doubling the recipe (swimming in zucchini, lately) and use 7 large instead of 6 XL eggs; seems to work great. I put one packet of Starbucks VIA in for a double batch, doubling the cinnamon and adding nutmeg. Yum-yum-yummm! Pleased you enjoyed the recipe and thank you for sharing your adaptations as well.